Young and old, wealthy or of modest means — everyone can make a difference in the quality of life for our region with a contribution to the Highland Area Community Foundation. Gifts of any size may be given to the Fund for Public Giving, an unrestricted component fund of the Foundation's permanent endowment. Income from the Fund is used to make a variety of grants addressing the community's needs. Individuals, organizations, and corporations contribute any amount to the Administrative Fund to provide ongoing administrative support for the Foundation. Individuals, organizations, and corporations contribute any amount to already established named funds. Memorial/honorarium gifts are thoughtful ways to remember special people. Along with the remembrance of each person, these gifts enable others in the community to benefit yet again from each of these individual's lives. The Sustaining Membership Program has various levels of membership – with your gift going directly to the general grants program each year. See below for membership levels. Many donors place no restriction on the possible applications for their fund, having come to understand that a critical aspect of the Foundation's mission is identifying and addressing changing community needs - which often cannot be anticipated at the time the fund is established. Field of interest funds may be used by donors to channel their resources into a broad area of concern such as health care, youth services, education, the arts, recreation, etc. The Foundation will then make grants from the earned income to programs or organizations in the field specified. A donor with a highly focused charitable interest may create a fund which is dedicated exclusively to a specific organization or purpose. The Foundation assumes oversight responsibility for ensuring that the income from the fund is distributed as the donor intends. 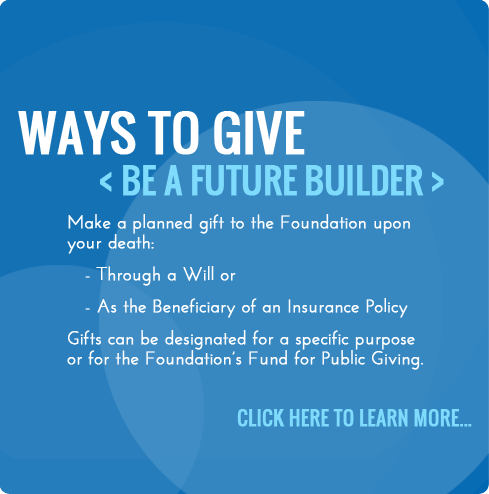 To establish a Future Builders Fund, donors advise the Foundation in writing of their decision to make a planned gift – either through a will or as beneficiary of an insurance policy - to the Foundation upon their demise. 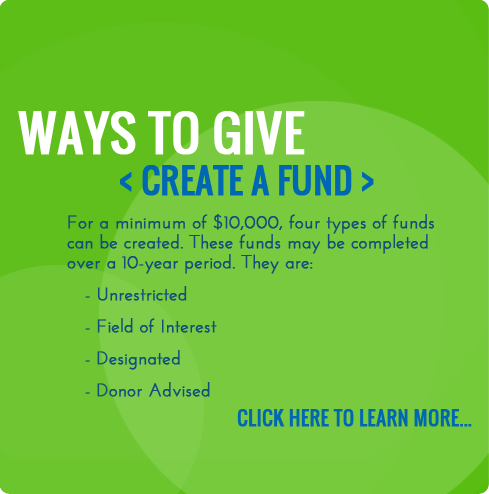 Gifts can be designated for a specific purpose or for the Foundation’s Fund for Public Giving.